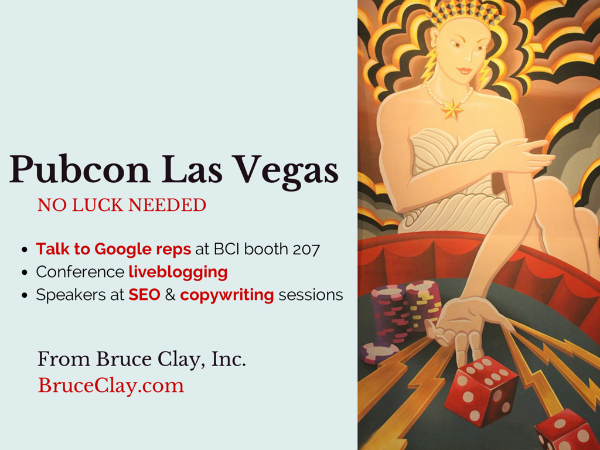 The Bruce Clay, Inc. team will be speaking, liveblogging and exhibiting at this week’s Pubcon Las Vegas. If you’ll be there, heads up that Google reps will be fielding questions about AdWords and Analytics at the the BCI booth 207 Wednesday from 12-2 p.m. If you’re interested in the session coverage we’ll be publishing all week, jump straight to the liveblog schedule here. You can also catch our President Bruce Clay and SEO Manager Mindy Weinstein, SEM Manager Michael Shore and Lead Sr. SEO Analyst Robert Ramirez, in Booth 207 in the Exhibit Hall. If you have any questions on SEO, SEM, SMM, content marketing or anything else Internet marketing-related, stop by the booth and fire away. We’d love to find out how we can help you grow your business. For those not attending Pubcon (or looking for copious session notes), check back on the BCI Blog all week long for liveblog coverage. Bruce Clay, Inc. blogger Kristi Kellogg will be liveblogging sessions as they happen.